These lines from Shakespeare’s Henry V suggest that every Englishman had wished he could have taken part in the Battle of Agincourt, 600 years ago on 25 October 1415. But just what was on the minds of those ‘gentlemen in England now a-bed’? Documents such as this one can give us some clues. The manor of Earls Colne (in this document referred to as Colne Comitis – Comitis being Latin for ‘count’, the continental version of the Anglo-Saxon ‘earl’) was part of the lands of the Earl of Oxford. Richard de Vere, the 11th earl, played a prominent part in the Battle of Agincourt, having supplied 39 men-at-arms and 60 archers to the campaign. He was rewarded for his part by being made Knight of the Garter in May 1416. 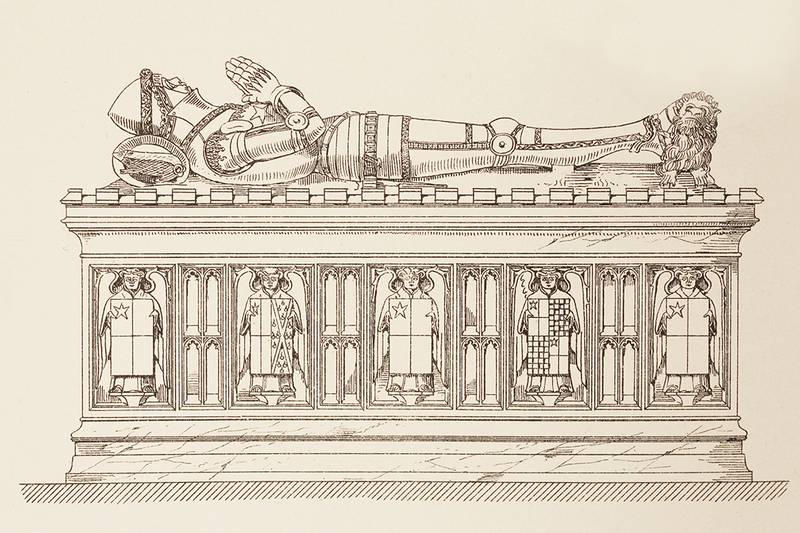 He died the following year and was buried at Colne Priory. This court, held only three weeks before the Battle of Agincourt, records the usual business of a manor court. Entries include Richard Hosyer fined 6d. for being a common poacher [venator] within the lord’s warren and fishgarth. Nine women were fined a total of 23d. for breaking the assize of ale and Christina and Rose Mason were fined 3d. each for breaking the assize of white bread. The assize regulated the price, weight and quality what was produced. Ralph Preston was fined 2s. 4d. for trespass and cutting down two oaks and an ash tree on Heyhous, the lord’s land. 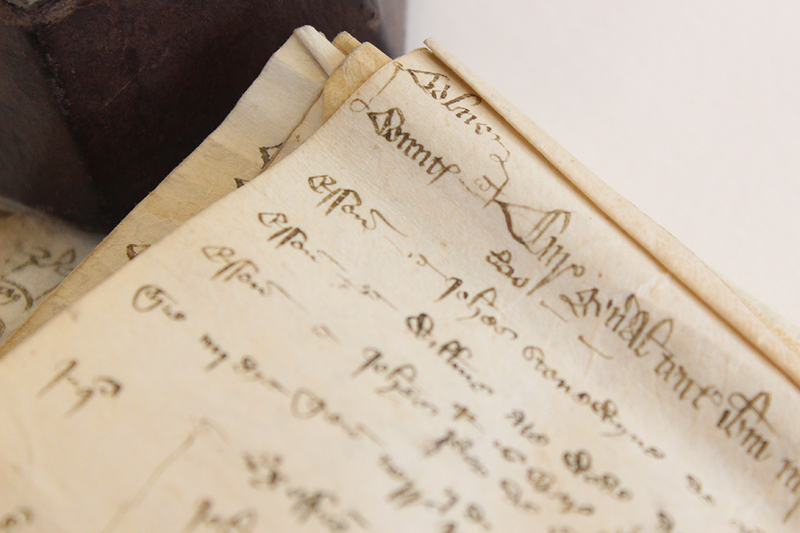 Land transactions were an important part of manorial business and those recorded include the surrender by John Turner of land called Berecroft (later Windmill Field) and the admission of Thomas Kelet, Robert Sebryght, John Bonjoon and Alice his wife on payment of a fine of 12d. John Dunstale was granted (for a fine of 6d.) the rent of a croft called Litelreycroft (later Rycroft) opposite the Hallegardyn for ten years at an annual rent of 7s. Robert Mathew was fined 68s. 6d. and lost his cattle for having claimed lands that did not belong to him by right of a false charter or deed of the Earl of Oxford. This was continued from the previous court held on 4 June where it was found that the deed dated from the reign of Edward III but the red wax seal was less than one year old (we feel this one needs some further investigation…). 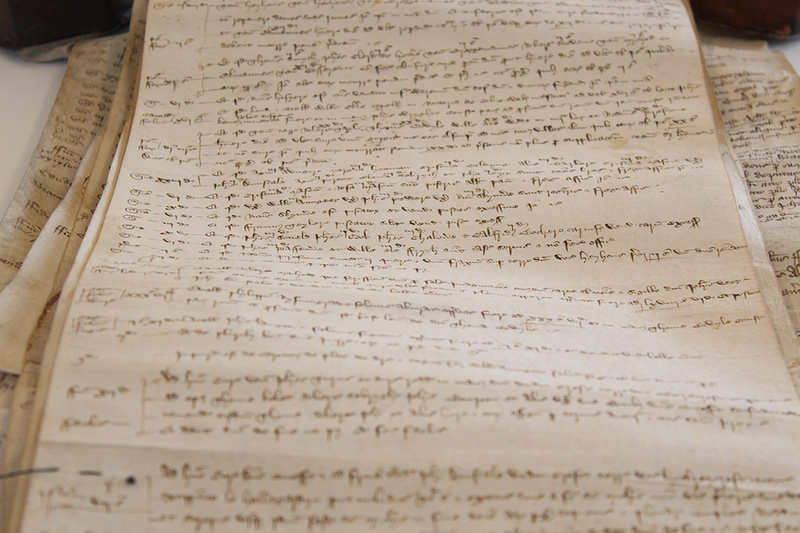 The roll will be on display in the Searchroom alongside two other Essex documents dating from 1415 as we prepare for Essex at Agincourt on Saturday 31 October 2015. Join us for talks from experts on one of the most famous battles in British history – all the details of the day are here.